White Pigeon Community Association is looking for help. Between now and June 24th we are accepting donations for this year’s events. All forms for our White Pigeon Days are listed below. Click on the blue area below for the form you need. 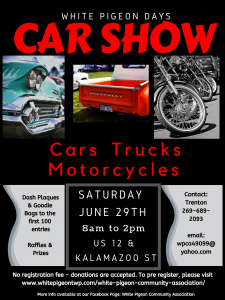 To enter the car show click on the blue are below. The following is a list of the past Citizens of the Year for White Pigeon Days. There are (4) names missing. If you remember those names please get in touch with us.